We approach every project with clear project management protocols. We take pride in our approach to planning our projects - whether they are small or complex in nature. This includes the understanding of scope and team roles, identifying schedule milestones and critical paths, knowing the budget parameters and exploring potential challenges up front. And, we develop strategies for a quality and safe job – on every job. 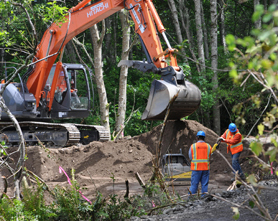 Cherokee Construction Services began as an environmental services firm. We understand the sensitivities involved and the due diligence required when addressing environmental issues. 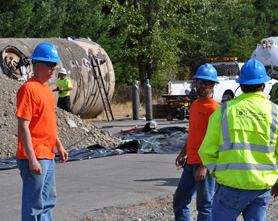 Whether remediating relatively simple low level petroleum contaminated soils or more acutely dangerous contaminants, our trained staff of operators, laborers and chemists understands how to safely and effectively remediate a site while conducting required sampling and documentation for regulators. Building Construction & RenovationOwners have valid reasons for taking either path of new construction or renovation to meet their facilities’ needs. New construction allows the owner create from scratch, with perhaps more freedom to manifest their vision. 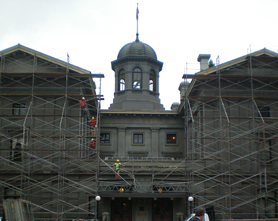 Renovating or rehabilitating existing facilities can preserve history and character and save money. Cherokee Construction Services, while capable of performing new building construction, has a particular aptitude for performing complex renovation work while keeping the facilities operational. This has been particularly important when it comes to our work in busy clinics and active hospitals as well as administrative and support facilities. We understand our clients need to continue to deliver their services during the construction work. We work with our customers and the building occupants to complete these types of projects with a minimum of distraction and inconvenience. Most of our projects are complete Design-Build packages. Civil ConstructionWe enjoy the nature of civil construction and the variety of work that we perform. Every civil project has its own character and complexity - keeping us at our best to continuously solve challenging project issues! Some of our most rewarding projects have been civil projects in diverse geographic regions. Reconstructing levees on various river systems, installing fish passage structures and constructing roads and infrastructure improvements all benefit a large number of people as well as enhance the world in which we live. Many of our projects are also Design-Build. This affords our customers an increased return on investment by utilizing the many years of experience that Cherokee has in civil work. Mechanical We possess great flexibility in the range of pipe systems. From installation of sewage lift stations and force mains to gravity systems inside and outside of building and structures, Cherokee has designed and constructed numerous mechanical systems. 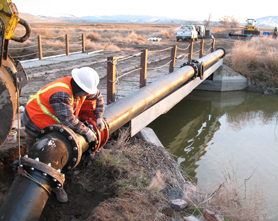 As a design-build contractor, we have the capability and experience to help our customers select the most appropriate pump and piping systems for their particular needs.